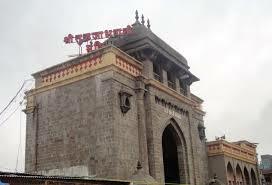 Here is Some Information about Tulja Bhavani Temple(Shakti Pith) in Tuljapur Maharashtra India. The Tuljadevi Temple(Shakti Pith) is located in Solapur Road, Tuljapur, Osmanabad, Maharashtra India.The temple was built in 12th century.The temple is dedicated to Goddesh Durga (Tuljadevi).The architecture of the Tuljabhavani temple is of Hemadpanti style, which was prevailant and famous in early Indian era. 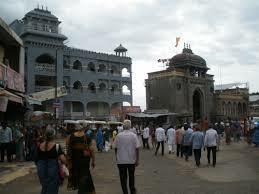 While entering the Tuljabhavani temple there are two big gates or Mahadwars. After entering the temple first we observe Kallol Tirtha which is a combination of one hundred and eigth tirthas or sacred waters. The Tuljabhawani temple is located on this hill. Another legend mentions the story of a a sage known as "Kardam" After his death his wife "Anubuti" had performed a penance at the banks of river "mandakini " for Bhavani mata to look after her infant child. While performing the penance the demon known "Kukur" tried to disturb her penance during which the Goddess came to the aid of "Anubuti" and killed the demon "Kukur". 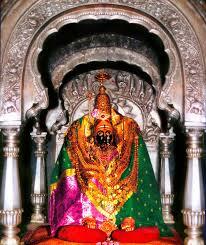 From that day onwards the Goddess Bhavani came to be known as Tulja Bhavani. The main entrance of the temple bears the name of Sardar Nimbalkar. The other two entrances are named after the parents of Shivaji Maharaj, that is Raja Shahaji, and Rajmata Jijavu. As one enters the Sardar Nimbalkar entrance, there is a temple dedicated to Markandeya Rishi on the right. After descending the stairs, one sees the main Tulja Temple. There is yagna kund in front of this temple. 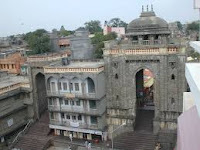 On the floor near two main gates (Raja Shahaji Mahadwar and Rajmata Jijavu main gate), there are two libraries named, Shree Santh Dnyaneshwar Dharmik Library and Shree Tukaram Dharmik Library. After alighting from the stairs, there is `Gomukh Theerth` on the right side and `Kalakh`, also known as `Kallol Theerth` on the left side. Before entering the Sanctum sanctorum of the Goddess, devotees take a dip here in these theerths (Shallow tanks of "holy" water). There are also Amruth Kund and a Datta temple on the premises. A Siddhi Vinayak temple is situated on the left side of the main gate whilst on the right, there is a temple of Aadishakti, Aadimata Matangadevi. A temple of goddess Annapurna is also present in the main complex. The idol of Goddess Tulja Bhawani is believed by her devotees to be swayambhu . The high granite idol is three-foot tall , with eight arms holding weapons, and bearing the head of the slain demon Mahishasura. The Goddess a is also known as Tulaja, Turaja, Tvarita and Amba. The history of the temple is also elaborated in the Skanda Purana. An old legend states that once there was a sage Kardam. When he expired, Anubuti- his wife made repentance to Goddess Bhavani along the banks of Mandakini River. While she was making repentance a demon named Kukur started disturbing her. This is when Goddess Bhavani came to the rescue of Anubuti and slew the demon. 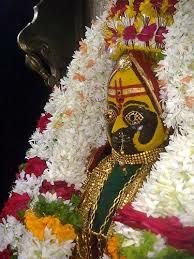 From then, Goddess Bhavani is known as Tulja Bhavani. Another legend states that in ancient times, the devtas and mankind were troubled by a demon Matanga. When the devtas approached Lord Brahma, he advised them to take help from Goddess Bhavani. She took the form of destroyer and overpowered the demon. A third legend states that Goddess Bhavani slayed another demon, Mhisha who was in the form of a buffalo. After slaying the demon she toll abode on the Yamunachala hill where the temple is located today. By Road : There are many public and private vehicles available to reach TuljaBhavani Temple in Tuljapur . By Train : The Nearest Railway station is Osmanabad - 30 km . By Air : The Nearest Airport is Solapur Airport - 52 km.